The Kitchen Remodel: How Much is Too Much? In the heat of the moment in any home renovation project, it can be easy to get carried away. When looking at all the stainless steel appliances, custom cabinetry, and countertop options, it’s important to think about what you need and why you are getting the renovation in the first place. Are you trying to improve the overall look of your kitchen, make it more functional, or both? Do you really just need new appliances? Let’s look at each part of a complete kitchen remodel. 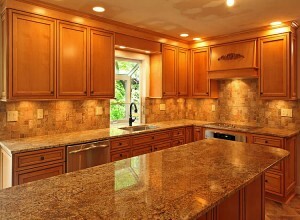 Prices for new kitchen countertops range from $35 to over $100 a square foot installed. How much you spend will depend on what you are looking for. There are plenty of affordable options that will last many years and may even be eco-friendly! Check out this post for some ideas. Chances are if you are upgrading your kitchen, you are annoyed with at least one of your outdated appliances. Choosing your new appliance can be daunting, as there are hundreds, no thousands of options to choose from! Make sure you get high quality appliances that will last, as they will get the most use in your kitchen, and you DO NOT want to go through repairs after you just had a major renovation. Custom cabinetry can be expensive, but offers a unique style that can be custom fitted to your home. They can be quite pricey, but for some people they are worth it. It all depends if you are leaning toward functional or aesthetic. Either way, get a professional to install them for you, the hassle of doing it yourself is not worth it! This entry is filed under Kitchen Remodeling and tagged kitchen design elements.